Toilets for St George Park? The public toilets at the edge of St George Park were closed on 6 January 2018. At the end of January many other public toilets across Bristol also closed. Do we need public toilets for St George Park? The last operational day for the temporary toilets will be Sunday 2nd September. (It will take a few more days, however, until they are physically removed.) The new school term starts on Monday 3rd September, and temporary facilities were intended to cover the busy school holiday period for St George Park. Cllr Asher Craig explained to the Voice "I have been exploring options to retain the temporary toilets in the park beyond the original agreement to cover the school holidays (a promise that I have delivered on). The Council cannot commit any further funds to retaining the toilets beyond the agreed date of 2nd September"
A decision on the potential allocation of funding for a permanent solution will be made at the Area 4 Committee Meeting of Bristol City Council being held on 13th September [meeting info]. Temporary toilets have opened in St George Park for the school holidays. Months after the public toilets on Church Road were closed, the Council has found some funding to provide some temporary toilets for the duration of the school summer holidays. 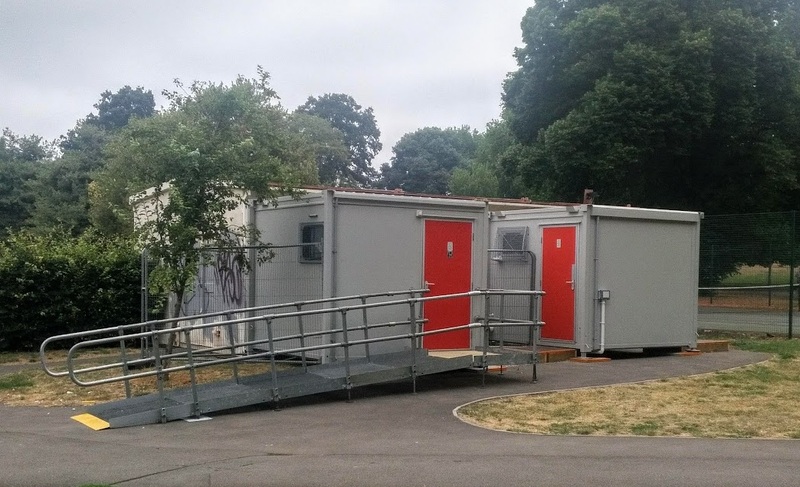 The temporary toilets have been located between the tennis courts and the Kiosk, making it a convenient location for the users of the kiosk, the John Deasy Children’s Play Area and the wheels park. The temporary arrangement is welcome return of facilities for St George Park, but this is only a short-term solution for the busy school holiday period. There is yet to be a long-term solution. Temporary toilets for St George Park due to open Saturday 21 July, and to remain open for the duration for the school summer holidays. 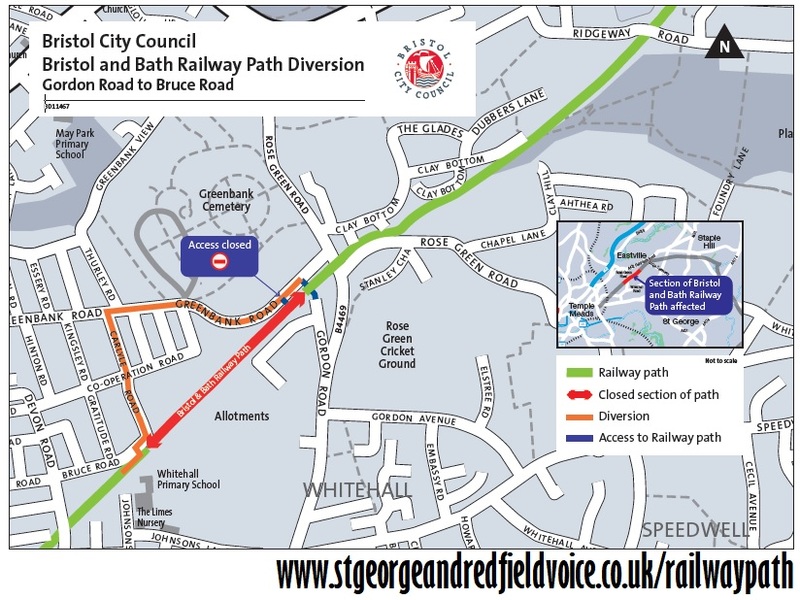 Toilets for St George Park was one of the issues discussed on BBC Radio Bristol on 16 July. 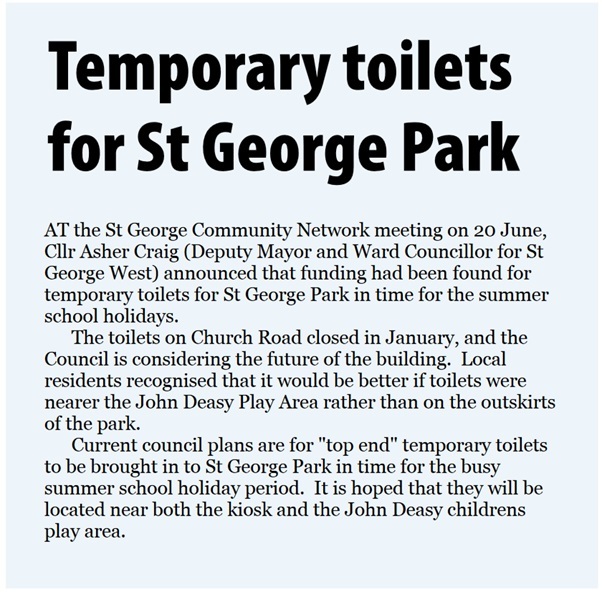 At the St George Community Network meeting on 20 June, Cllr Asher Craig (Deputy Mayor and Ward Councillor for St George West) announced that funding had been found for temporary toilets for St George Park in time for the summer school holidays. The toilets on Church Road closed in January, and the Council is considering the future of the building. Local residents recognised that it would be better if toilets were nearer the John Deasy Play Area rather than on the outskirts of the park. 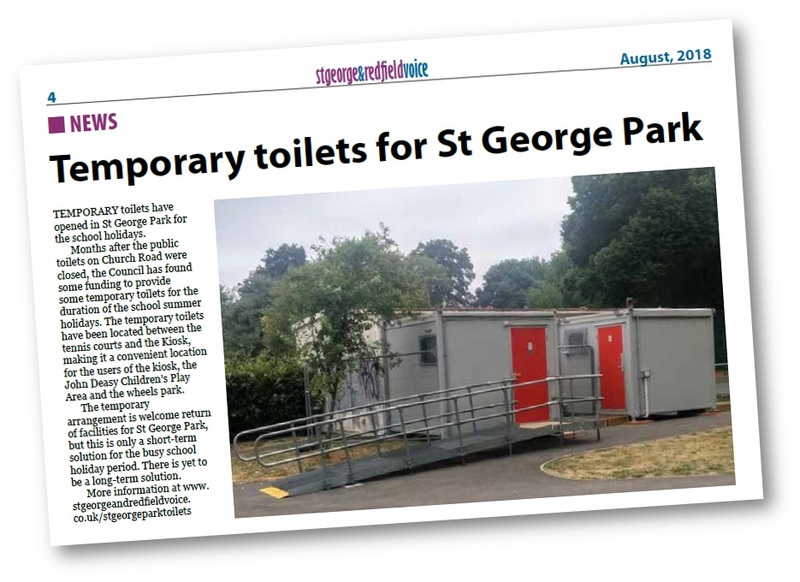 Current council plans are for "top end" temporary toilets to be brought in to St George Park in time for the busy summer school holiday period. It is hoped that they will be located near both the kiosk and the John Deasy childrens play area. 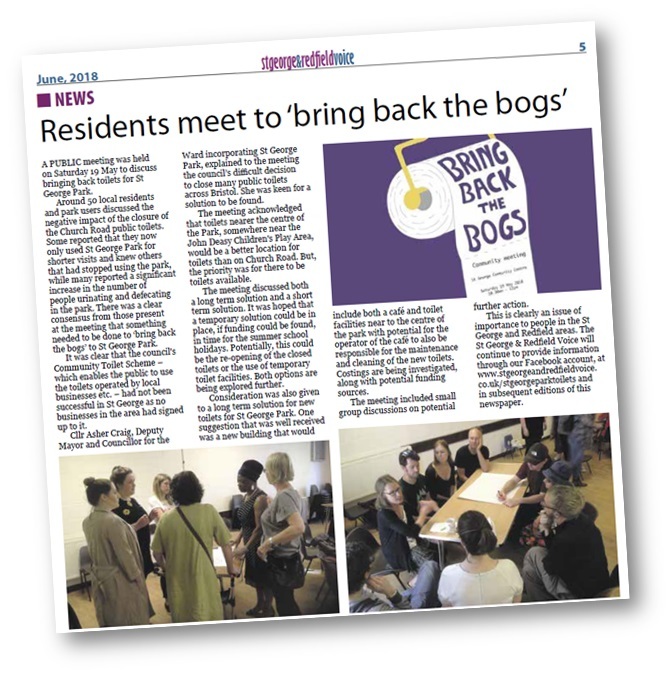 A Public Meeting was held on Saturday 19 May to discuss bringing back toilets for St George Park. 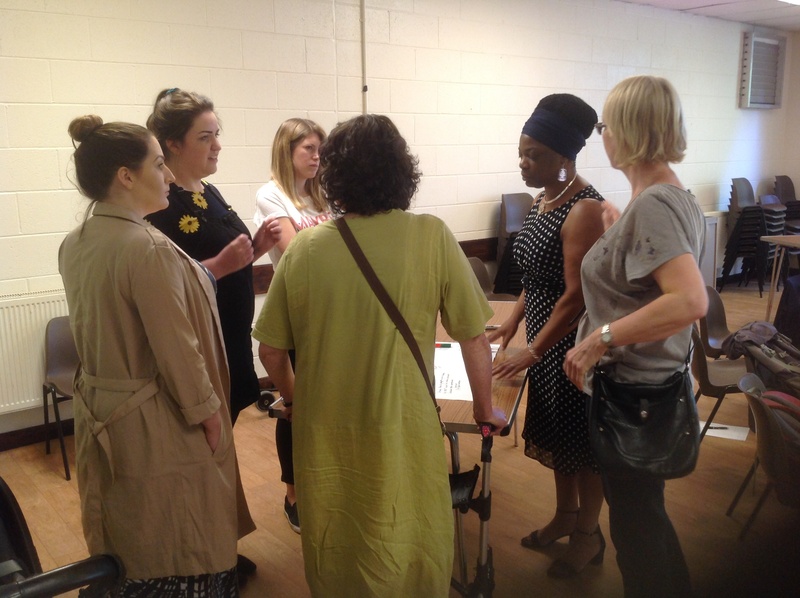 Around 50 local residents and park users discussed the negative impact of the closure of the Church Road public toilets. Some reported that they now only used St George Park for shorter visits and knew others that had stopped using the park, while many reported a significant increase in the number of people urinating and defecating in the park. There was a clear consensus from those present at the meeting that something needed to be done to ‘bring back the bogs’ to St George Park. It was clear that the council's Community Toilet Scheme – which enables the public to use the toilets operated by local businesses etc. – had not been successful in the area as no businesses in the area had signed up to it. Cllr Asher Craig, Deputy Mayor and Councillor for the Ward incorporating St George Park, explained to the meeting the council’s difficult decision to close many public toilets across Bristol. She was keen for a solution to be found. The meeting acknowledged that toilets nearer the centre of the Park, somewhere near the John Deasy Children's Play Area, would be a better location for toilets than on Church Road. But, the priority was for there to be toilets available. The meeting discussed both a long term solution and a short term solution. It was hoped that a temporary solution could be in place, if funding could be found, in time for the summer school holidays. Potentially, this could be the re-opening of the closed toilets or the use of temporary toilet facilities. Both options are being explored further. Consideration was also given to a long term solution for new toilets for St George Park. One suggestion that was well received was a new building that would include both a café and toilet facilities near to the centre of the park with potential for the operator of the café to also be responsible for the maintenance and cleaning of the new toilets. Costings are being investigated, along with potential funding sources. The meeting included small group discussions on potential further action. This is clearly an issue of importance to people in the St George and Redfield areas. 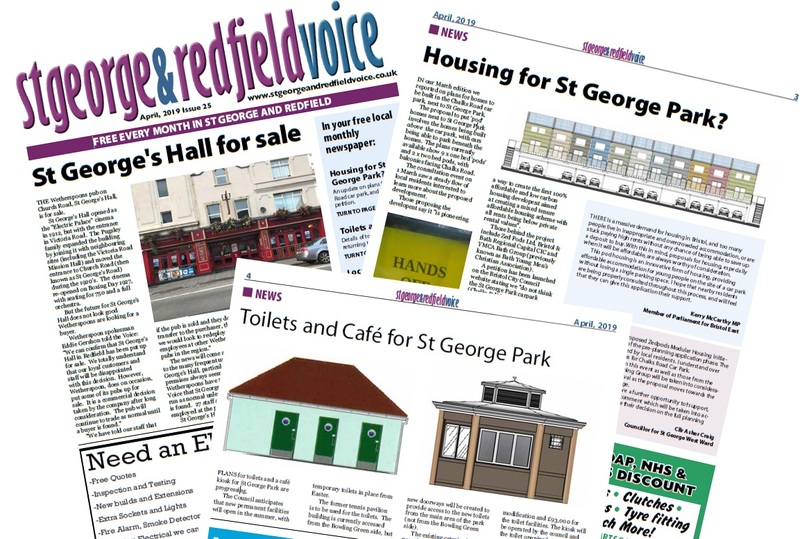 The St George & Redfield Voice will continue to provide information through our Facebook account, at www.stgeorgeandredfieldvoice.co.uk/stgeorgeparktoilets and in subsequent editions of this newspaper. 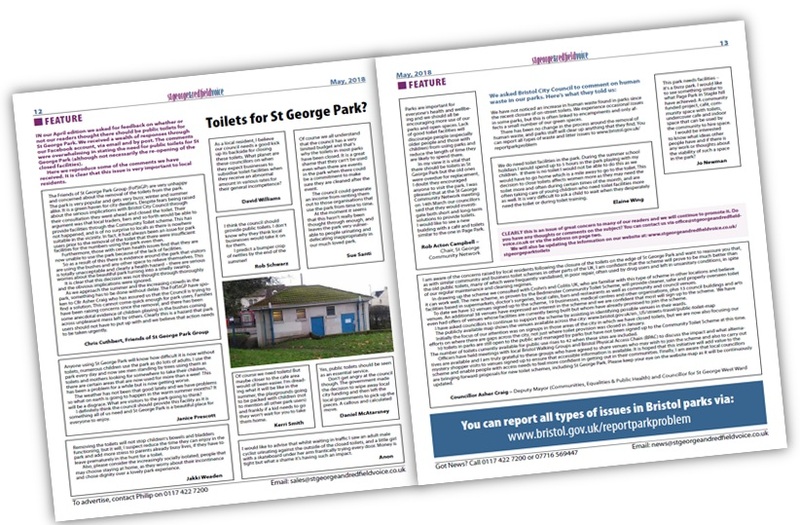 In our April edition we asked for feedback on whether or not our readers thought there should be public toilets for St George Park. We received a wealth of responses through our Facebook account, via email and by post. The comments were overwhelming in stating the need for public toilets for St George Park (although not necessarily the re-opening of the closed facilities). Here we reproduce some of the comments we have received. It is clear that this issue is very important to local residents. The Friends of St George Park Group are very unhappy and concerned about the removal of the toilets from the park. The park is very popular and gets very busy, winter and summer alike. It is a green haven for city dwellers. 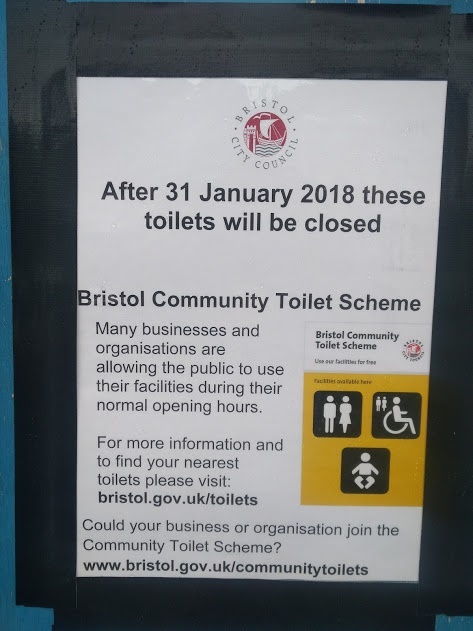 Despite fears being raised about the serious implications with Bristol City Council through their consultation they went ahead and closed the toilet. Their argument was that local traders, bars and so forth would be able to provide facilities through the Community Toilet scheme. This has not happened, and is of no surprise to locals as there is nowhere suitable in the vicinity. In fact, it had always been an issue for park users prior to the removal of the toilet that there were insufficient facilities for the numbers using the park even then. Furthermore, those with certain health issues find that they are now unable to use the park because of the lack of facilities. So as a result of this there is evidence around the park that visitors are using the bushes and any other space to relieve themselves. This is totally unacceptable and clearly a health hazard - there are serious worries about the beautiful park turning into a smelly swamp. It is clear that this decision was not thought through thoroughly and the obvious implications were ignored. As we approach the summer and the increasing crowds in the park, something has to be done without delay. The FofStGP have spoken to Cllr Asher Craig who has assured us that the Council is trying to find a solution. This cannot come quick enough for park users. Families have been raising concerns since the removal, and there has been some anecdotal evidence of children playing in the bushes coming across unpleasant mess left by others. Clearly this is a hazard that park users should not have to put up with and we believe that action needs to be taken urgently. Anyone using St George Park will know how difficult it is now without toilets, numerous children use the park as do lots of adults. I use the Park everyday and now see men standing by trees using them as toilets and mothers looking for somewhere to take their children, there are certain areas that are now used for more than a wee! This has been a problem for a while but is now getting worse. The weather has not been that good lately and we have problems so what on earth is going to happen in the warm summer months? It will be a disgrace. What are visitors to the park going to think? I definitely think the council should provide this facility as it is something all of us need and St George Park is a beautiful place for everyone to enjoy. Removing the toilets will not stop children's bowels and bladders functioning, but it will, I suspect reduce the time they can enjoy in the park and add more stress to parents already busy lives, if they have to leave prematurely in the hunt for a toilet. Also, please consider the increasingly socially isolated, people that may choose staying at home, as they worry about their incontinence and chose dignity over a lovely park experience. As a local resident, I believe our council needs a good kick up its backside for closing these toilets. What planet are these Councillors on when they expect businesses to subsidise toilet facilities when they receive an abnormal amount in various rates for their general incompetence? I think the council should provide public toilets. I don't know why they think local businesses would take it on for them. I predict a bumper crop of nettles by the end of the summer! Of course we all understand that the Council has a very limited budget and that's why the toilets in most parks have been closed. It is a great shame that they can't be used even when there are events in the park when there could be a commitment to make sure they are cleaned after the event. The council could generate an income from renting them out to those organisations that use the park from time to time. At the moment it seems that this hasn't really been thought through enough, and leaves the park very vulnerable to people urinating and defecating inappropriately in our much loved park. Of course we need toilets! But maybe closer to the café area would of been easier. I'm dreading what it will be like in the summer, the playgrounds going to be packed with children (not to mention all other park users) and frankly if a kid needs to go they won't wait for you to take them home. Yes, public toilets should be seen as an essential service. Don’t get angry at the Council though. The government made the decision to wipe away local city funding and then left the local governments to pick up the pieces. A callous and calculated move. I would like to advise that whilst waiting in traffic I saw an adult male cyclist urinating against the outside of the closed toilets, and a little girl with a skateboard under her arm frantically trying every door. Money is tight but what a shame its having such an impact. Parks are important for everyone's health and wellbeing and we should all be encouraging more use of our parks and open spaces. Lack of good toilet facilities will discourage people (especially older people and those with children) from using parks and reduce the length of time they are likely to spend there. In my view it is vital that there should be toilets in St George Park but the old ones were overdue for replacement, I doubt they encouraged anyone to visit the park. 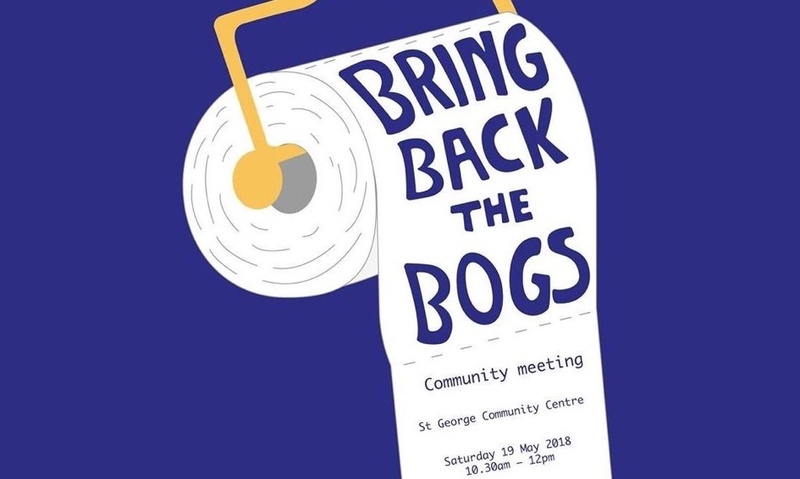 I was pleased that at the St George Community Network meeting on 14th March our Councillors said that they would investigate both short and long-term solutions to provide toilets. I would like to see a new building with a café and toilets similar to the one in Page Park. We have not noticed an increase in human waste found in parks since the recent closure of on street toilets. We experience occasional issues in some parks, but this is often linked to encampments and only affects a small number of our green spaces. We do need toilet facilities in the park. During the summer school holidays I would spend up to 5 hours in the park playing with my children. If there is no toilet I would not be able to do this as we would have to go home which is a mile away to go to the toilet. This decision to close toilets affects women more as they may need the toilet more and often during certain times of the month, and are often taking care of young children who need toilet facilities more as well. It is very difficult to ask a child to wait when they desperately need the toilet or during toilet training. This park needs facilities - it's a busy park. I would like to see something similar to what Page Park in Staple hill have achieved. 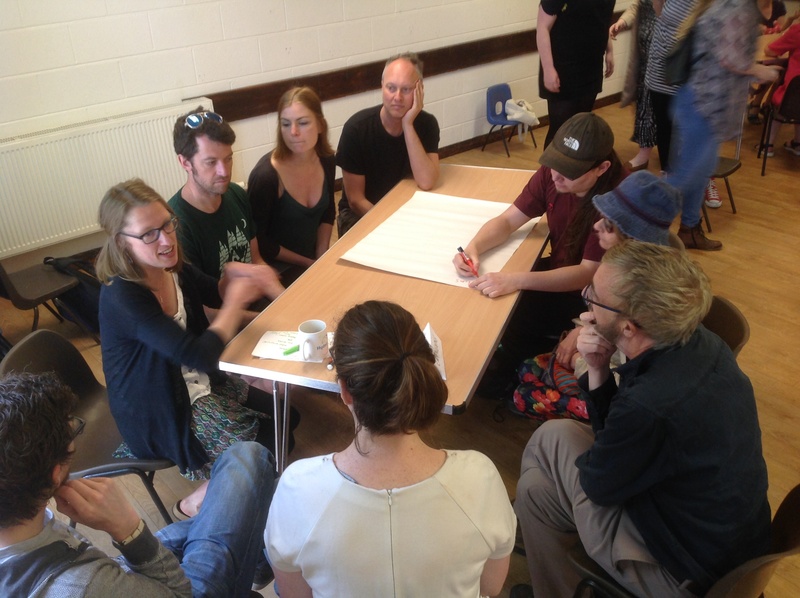 A community funded project, café, community space with toilets, undercover cafe and indoor space that can be used by the community to hire space. I would be interested to know what ideas other people have and if there is any work or thoughts about the viability of such a space in the park? I am aware of the concerns raised by local residents following the closure of the toilets on the edge of St George Park and want to reassure you that, as with similar Community & Business Toilet schemes in other parts of the UK, I am confident that the scheme will prove to be much better than the old public toilets, many of which were frequently vandalised, in poor repair, often used by drug users and left in unsanitary conditions, in spite of our regular maintenance and cleaning regimes. In drawing up the scheme we consulted with Crohn’s and Colitis UK, who are familiar with this type of scheme in other locations and believe it can work well. 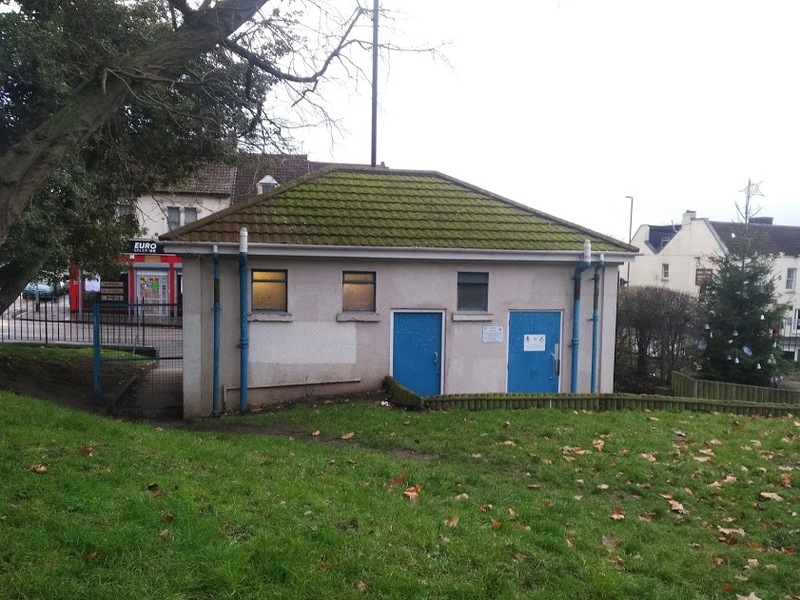 The new scheme, as proven by the Bedminster Community Toilet Scheme, will provide cleaner, safer and properly overseen toilet facilities based in supermarkets, doctor’s surgeries, local cafés, bars and restaurants as well as community and council venues. To date we have 32 venues signed up to the scheme, 19 businesses, medical centres and other organisations, plus 13 council buildings and arts venues. An additional 38 venues have expressed an interest in the scheme and we are confident that most will sign up to the scheme. We have even had offers of venues whose facilities are currently being built but whom have already promised to join the scheme. I have asked councillors to continue to support the scheme by assisting in identifying possible venues in their wards. Initially the focus of our attention was on signups in those areas of the city in which we have closed toilets, but we are now also focusing our efforts on where there are gaps across the city, not just where toilet provision was closed in January. 10 toilets in parks are still open to the public and managed by parks but have not been signed up to the Community toilet scheme at this time. The number of toilets currently available for public use rises to 42 when these sites are included. 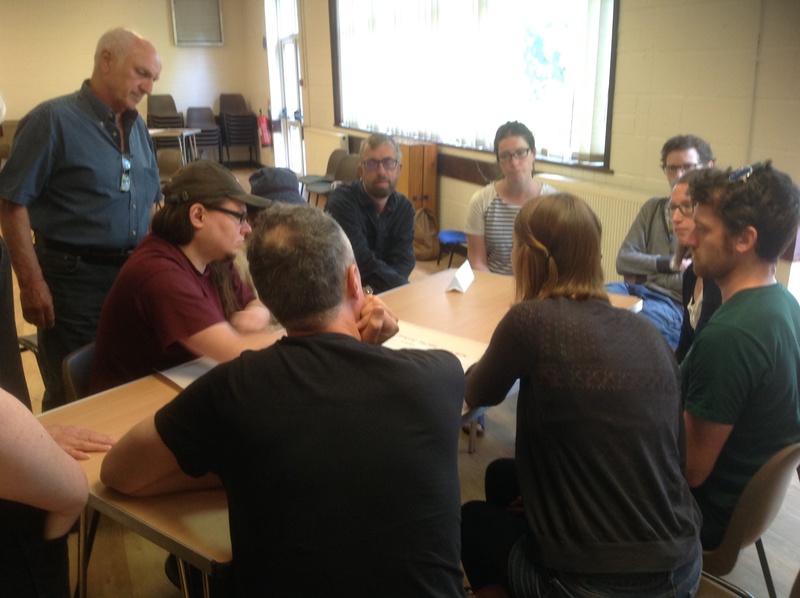 Officers have held meetings with local Bristol Walking Groups and Bristol Physical Access Chain (BPAC) to discuss the impact and what alternatives are available and I am truly grateful to these groups who have agreed to share venues who may wish to join the scheme and also to carry out Mystery shopper visits to venues signed up to ensure that accessible information is available. It is hoped that this initiative will add value to the scheme and enable people with access needs to feel more confident in getting out in their communities. Finally, I am aware that local Councillors are bringing forward proposals for new toilet schemes, including St George Park. Please keep your eye on the website map as it will be continuously updated. Anyone who has spent any time in St George Park will know that it is a busy area, particularly at weekends and during the school holidays. The John Deasy children’s play park and the Wheelpark are particularly well used areas of the park. We reported in the February edition of the St George & Redfield Voice on the council's Community Toilet Scheme. The scheme was intended to provide a network of toilets available for use by the public within business and community premises. The plan being that the network of facilities would be operational before the public toilets closed. So, a few months after the closure of the toilets in St George Park, where are the nearest alternative facilities? You can check the latest list at www.bristol.gov.uk/communitytoilets But, when we went to print with our April 2018 edition there were NO facilities in the BS5 area at all! UPDATE: Since going to print Burger King at Eastgate Shopping Centre has been added to the list. Anyone who has ever used the toilet facilities in St George Park will know that they were far from salubrious; some had described them as not fit for purpose. But, at least they were available. There is no statutory requirement on the council to provide public toilets, and so the closure of facilities around the city was part of the council's cost saving plans. The toilet facilities in St George Library are open to library users during normal opening hours, but they're not formally part of the Community Toilet Scheme. The nearest council offices to St George Park are at St Anne's House, St Annes Road – but the toilets are in a secure part of the building and are not accessible to the public. 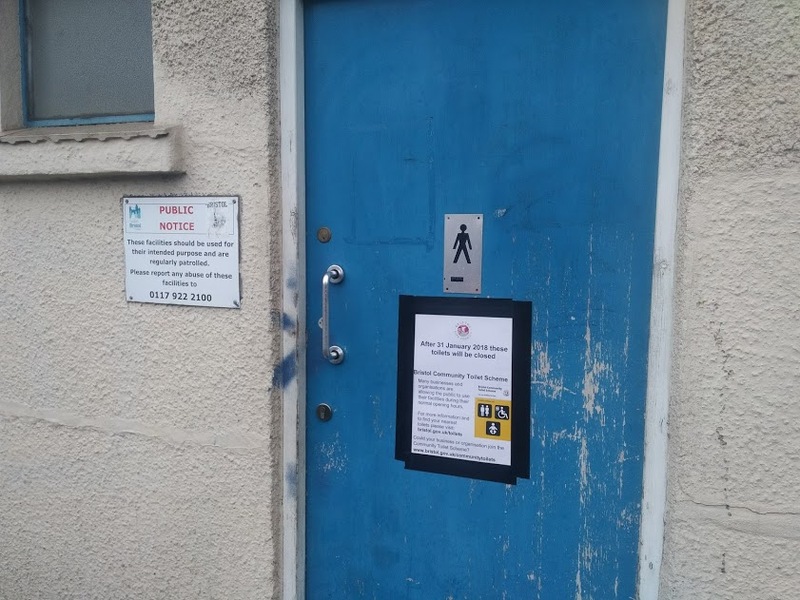 The council has told us that they've approached various local businesses to join the Community Toilet Scheme, but to date none have formally signed up to the scheme. The council aren't offering any funding to those organisations that sign up to the scheme, and so the organisation providing the facilities need to meet the additional running costs as well as ensuring they have public liability insurance and keeping the toilets available and clean. We asked the council what their plans were for the now unused toilet building in St George Park. We've been told that nothing is finalised for the St George Park toilets and that if there are expressions of interest for its future use, these would be considered. The council will consider the future of all the closed toilet facilities on a case by case basis. Some may be sold, others may be leased to third parties, whilst some may be considered for Community Asset Transfer (i.e. 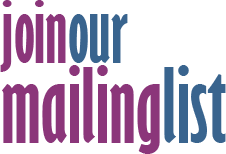 made available for use by a community group). 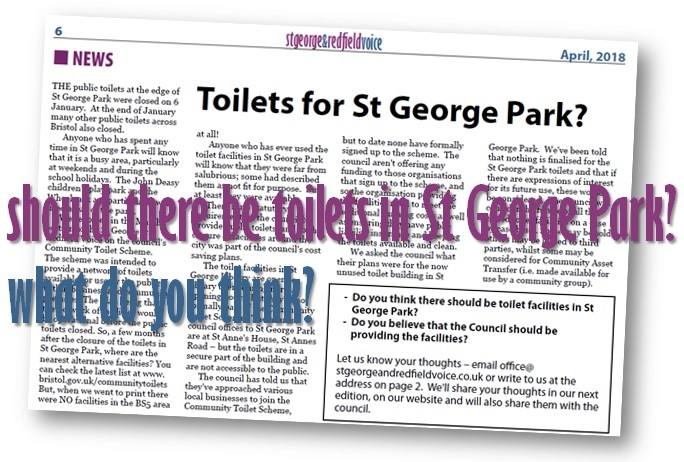 - Do you think there should be toilet facilities in St George Park? - Do you believe that the Council should be providing the facilities? 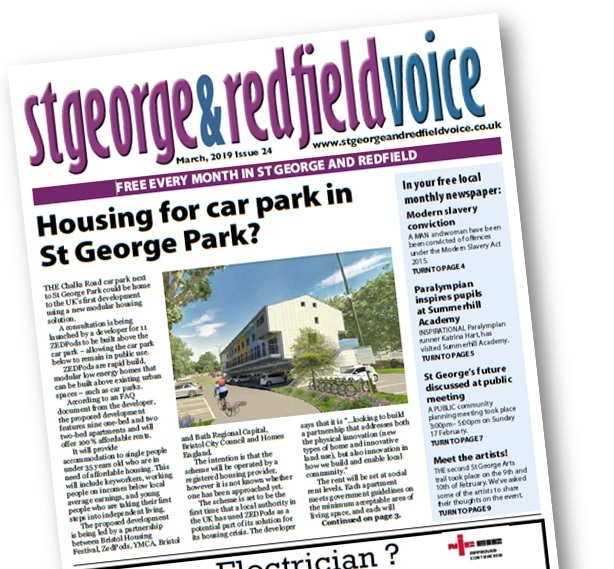 Let us know your thoughts – email office@stgeorgeandredfieldvoice.co.uk or write to us at St George & Redfield Voice, Easton Business Centre, Felix Road, Bristol BS5 0HE. We'll share your thoughts in our next edition, on our website and will also share them with the council.